Azure has responded to the demand from American artisan bakers that want loaf volume while retaining the flavor and nutrition of the bran and germ kernel elements. EX-85 extraction flour does just that. Traditional industrial “roller milled” white flour only extracts 72% to 75% of the kernel volume in the process of removing all the bran and the germ elements. In contrast, by directly sifting our fine “Unifine” milled whole grain flour, our “EX-85” flour retains at least 85% of the kernel. In the process, our lab tests confirmed that we retain most of the bran and germ fiber and other micronutrients, nutrition that is virtually eliminated in the production of the white flour market that EX-85 targets. It’s worth noting that over 150 years ago the development of the “roller mill” technology was motivated by the incorrect assumption that it was the bran and germ elements that were responsible for baking density. In fact, the primary culprits are simply the larger flour particles that puncture the bubbles in the rising dough. By directly sifting whole grain flour (very common in Europe), EX-85 only extracts about 10% of the kernel volume, retaining most of the nutritious and flavorful bran and germ elements. 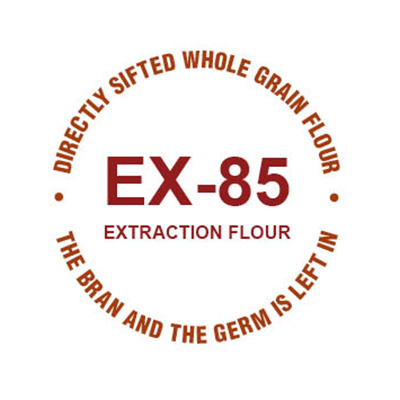 The American milling industry has coined this unique new flour EX-85 as the extraction is at least 85% compared to the 72% of nutritionally benign industrial white flour. We offer two extraction flours, one is made from one of our heritage varieties of wheat. If you want to bake a fantastic loaf of rustic colored, artisan bread, this is the flour for you. This wheat has the highest concentration of protein of any flour you can find in the U.S. At <16 percent protein, it will make a light, deliciously crusty loaf every time. Our other extraction flour is made from hard white wheat for those who prefer a lighter colored loaf. At >13 percent protein, it won’t have the same loaf volume as our darker colored heritage flour, but you’ll find both these flours will perform well. In our bench tests of these flours we found they were able to absorb more water than white flour to achieve a comparable dough feel (that's always good news to a bread baker). It will come to development quickly. The dough itself has been found to stretch into thin sheeted "baker's windows" with ease, but with the elasticity and tenacity to resist this stretching without breaking easily or simply falling apart. The ferment is typically about 30 minutes faster than that of white flour dough over the course of 6 hours. When fully fermented, this dough will retain gas on par with white flour dough, maintaining its strength through handling and shaping. The loaf volume is typically 3/4-4/5 that produced by white flour dough, with a nice open crumb structure and a uniquely soft texture for a mostly whole flour loaf. EX-85 is remarkable for its ability to hold gas and be handled on the bench with very little deflation. Our artisan bakers have never experienced working with this quality of dough at the level of extraction this flour was milled and the quantity of bran it contains. It will proof and bake on par with white flour. We’ve found the oven spring on the EX-85 to be sufficient to open the ears on the scores which can be difficult with high hydration, whole flour dough. With only minor recipe modifications, you’ll find that EX-85 will create a dough that handles like a white flour dough, has the tolerance required of long fermentations and will produce stunning loaves of bread. It offers the artisan baker the opportunity to provide a more nutritious, holistic loaf of bread with the visual appearance, textures, and volumes that have been heretofore were only possible with refined white flour. Bon appetit.